If you have a well-written studio policy, then students who miss their fair share of lessons may not be a big concern for you. After all, it’s 30 minutes of paid time for you to tidy the studio, sneak some practice time, and change over the laundry, right? However, students who miss lots of piano lessons actually pose a risk to your studio that is bigger than you may think. Do you have a Missy Miss-a-lot at your studio? If you do, you’ll need to read on. 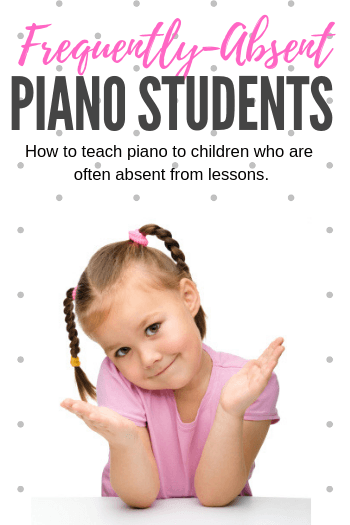 There are the obvious reasons why piano students who miss many lessons are not the ideal kind of student (paid housecleaning time aside!). Of course their progress will be slow and their enthusiasm will wane, but there are other less obvious reasons why these students need our attention. 1) Missy Miss-a-lot is not great advertising: The problem with Missy is that while she doesn’t attend often attend lessons, you can bet she will attend your recitals, play for friends and family, and insist on performing at her school talent show wearing your studio’s logo on her t-shirt (shudder!). Her lack of lesson time (and therefore lack of skill) doesn’t make her the ideal “poster child” for your studio. 2) Missy Miss-a-lot’s parents = not so warm and fuzzy Regardless of being compliant with your piano studio policy, all parents dislike paying for lessons they miss. Even if Missy’s parents seem nonchalant about the dollars they’ve dumped down the drain… deep inside a seed of resentment is growing. You’ll lose Missy sooner or later, and your hard work and effort will be for naught. 3) Missy Miss-a-lot is occupying valuable real estate: If you haven’t had the heart to give her the heave-ho (and if so, you’re just like me!) then Missy is occupying some valuable real estate in your studio schedule. Her (often unused) timeslot is not only taken up by a fairly unproductive student, but you are also missing out on word-of-mouth advertising that you could be gaining from a committed and happy student. 1) Give Missy a reason to remember her lessons: Missy Miss-a-lot most likely comes from a family who is fairly unscheduled and noncommittal. However, if Missy is the “squeaky wheel” at home then piano lessons may just be remembered. If your piano lessons are the highlight of her week, she’s more likely to remember… and then remind those with the driver’s licenses. 2) Add one more task to your week: I know you’re busy, but a quick reminder phone call or email the evening before (or the morning of) her lesson will do wonders. More often than not, by the 6th time you’ve called Missy’s parents will get the hint and make you a priority and the phone calls will no longer be needed. This is also a great way to touch base, inform them of how wonderful she was her her previous lesson, and offer words of encouragement for at-home practice. 3) Out with the Practice Incentive, in with the Lesson Incentive: Use a similar approach as you would a student who rarely practices and set Missy up with a lesson incentive program. Give her a visual way to track the lessons she attends and offer a prize after every 5 lessons in a row. She’ll definitely be chatting about this at home and most parents don’t want to let their child down. They’ll get her there. Try This Studio Challenge And Watch Practice Hours Grow!